The dangers of mold exposure go beyond unsightly patches on wallpaper or beneath bathroom sinks. Mold spores are easily inhaled and can cause or aggravate respiratory problems, including permanent lung damage from some strains. Since mold is so common—one gram of house dust can contain thousands of mold spores—understanding the underlying causes of indoor mold is the key to keeping your home and family safe. What is Mold, and Why is it in My Home? Mold is a naturally occurring fungus that breaks down organic material like dead trees and fallen leaves. Mold grows in wet or damp areas and reproduces by releasing spores that float through the air and are invisible to the naked eye. Mold spores move through indoor and outdoor air alike, attaching to household dust and other airborne particles. While mold serves an important purpose in the natural environment, its destructive essence can be harmful to your home and furnishings. Mold can also be dangerous to your family, especially those with respiratory conditions like asthma or allergies. Alternaria: This mold grows in damp indoor places like showers or beneath sinks with leaky pipes. It moves easily from one area to another, and is also found in homes or buildings that have flooded or suffered water damage. Aspergillus: Another type of mold frequently found indoors, aspergillus encompasses several hundred mold species that occur worldwide. Cladosporium: This mold often grows on damp wood surfaces, such as cabinets and floorboards, as well as fabrics, like carpets and drapes. Cladosporium can survive in both warm and cool climates, and is often found inside homes. Penicillium: Usually appearing as a blue or green mold, penicillium is often found on water damaged materials like wallpaper, carpeting, insulation, and mattresses or other furnishings. It also spreads easily throughout the home. 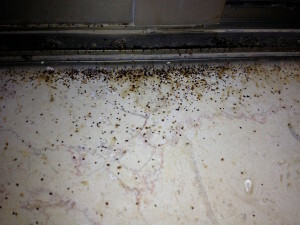 For more types of mold and how they occur, visit mold-adviser.com. Molds produce substances that cause allergic reactions (allergens), irritants, and potentially toxic substances (mycotoxins) in some cases. Exposure to mold, especially in those prone to respiratory problems, can cause allergic reactions, chronic sinus infections, and asthma attacks, among other conditions. 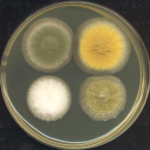 Stachybotrys chartarum, often referred to as “black mold” or “toxic mold,” produces mycotoxins that can cause significant health problems, especially in infants and children, the elderly, and individuals with pre-existing health problems. Symptoms of exposure to black mold include difficulty breathing, sneezing and coughing, sore throats, itchy or watery eyes, asthma attacks, sinus infections, fatigue, and depression. Mold often grows in hidden places, including under carpets and floorboards, inside walls, above ceiling tiles, and inside air conditioning and heating ducts. If you see mold, it is likely that there is more mold you can’t see. Mold growing in homes and buildings indicates a problem with water or moisture. While some molds can be removed with soap and water or a diluted bleach solution, if the underlying water problem is not addressed, the mold is likely to return. To keep mold out of your home, check for damp surfaces or standing water. If you have mold and are unsure that you can completely remove it yourself, contact a professional contractor or mold removal professional. Cal-Best Construction is a family owned and operated general contractor, and can help remove mold and restore your home or business to its proper condition. Contact us or call 714.630.1180 to speak with a restoration specialist today. We look forward to assisting you!